Ever since Briareus pointed out Charles Johnson’s strawman obsession with the KKK, discussion about that organization has become a regular topic at LGF. Currently, Anonymous has declared war on the KKK and has been exposing them online. The LGFers who normally despise Anonymous, are cheering that organization. 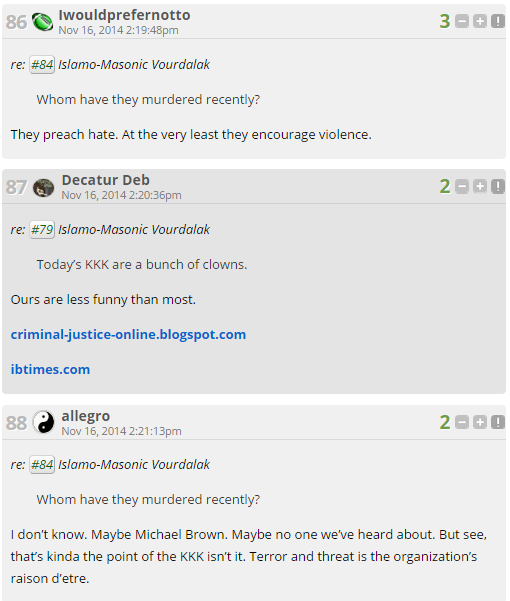 Sergey Romanov pointed out the KKK are a bunch of clowns. This prompted paranoid ranting at LGF about the KKK threat.